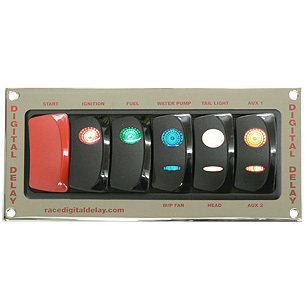 The Switch Panel is a brand new product designed by Digital Delay. 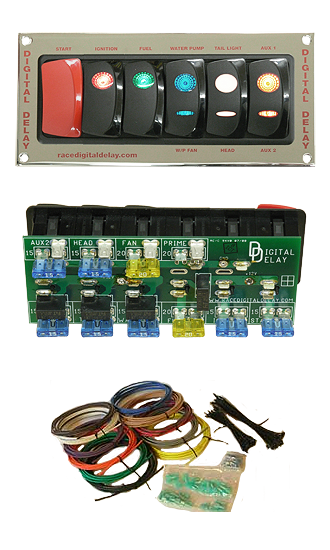 The new Switch Panel consists of a high current switch panel with built in relays, and a wiring kit. 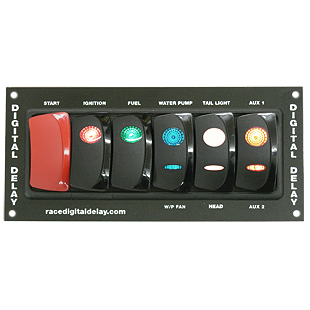 The sleek and compact Switch Panel has 6 labeled switches to control your car’s most important functions. The starter switch is a red momentary switch. The ignition and fuel pump switches are dual position switches while the Fan/Water Pump, Head light/Tail light, and Aux 1/Aux 2 are all three position switches. To speed up the wiring process, the Switch Panel has push-on spade plugs for each output. Also each of the Switch Panel outputs has its own fuse. At the 80 amp total load rating the Switch Panel has the highest current rating for any stand alone switch panel. 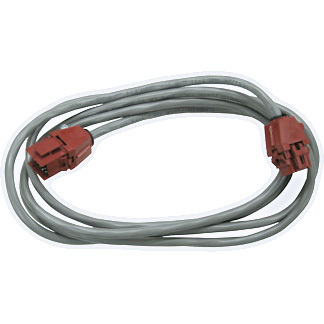 The Wiring Kit includes enough color coded wire, connectors, wire ties and a complete color coded diagram to help you neatly wire a vehicle. 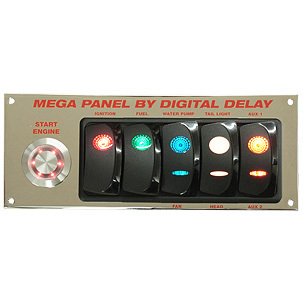 The Switch Panel Chrome is a brand new product designed by Digital Delay. 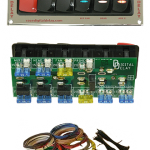 The new Switch Panel consists of a high current switch panel with built in relays, and a wiring kit.